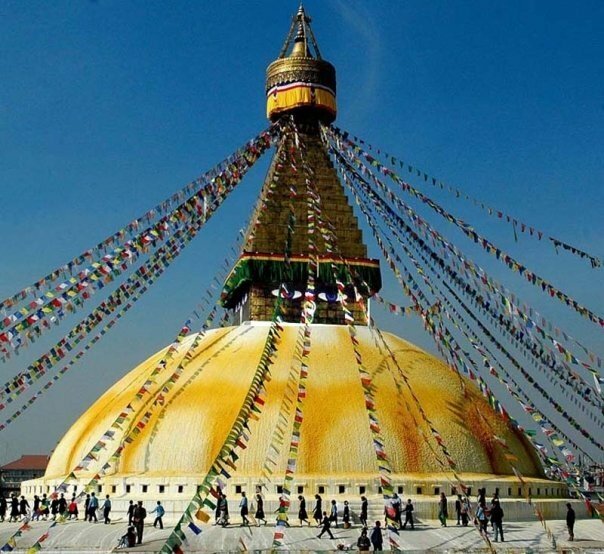 This specially designed package tour offers sightseeing tour of three historic cities of Kathmandu Valley. We visit Pashupatinath temple, the biggest Hindu temple in South Asia and two other major cultural heritage sites: Boudhanath Stupa and Swoyambhunath. Then we drive to scenic lake city - Pokhara and sightseeing around. Next day morning we fly to Jomson to pay a visit to Muktinath temple at an altitude of 4100m. It is believed that both Hindus and Buddhist should visit this temple once in a lifetime to attain spiritual salvation. Nearby Muktinath temple there is another Jwala Mai temple that has a natural spring and one can see an eternal flame fed by natural gas underground. Day 04 : After breakfast take the early morning, flight to Jomsom and then take a jeep to Kagbeni ( 2800 m ) . Check in hotel , have a lunch & excursion around Kagbeni. Overnight at lodge in Kagbeni. Day 05: Early morning drive to Muktinath by jeep. Visit the temple & drive back to Jomsom. Overnight at lodge / hotel in Jomsom. Day 08 : Drive to airport for find departure. Airport pick up, transfer & drop by car / van / bus as per group size. 3 nights hotel accommodation in Kathmandu on B/ B plan.